Remember this guy? Well I've gotten quite a few requests for the pattern. Hopefully yours will look better than mine. But the theory is if you follow these basic directions, you'll be able to have a rebellious dishrag of yer very own. 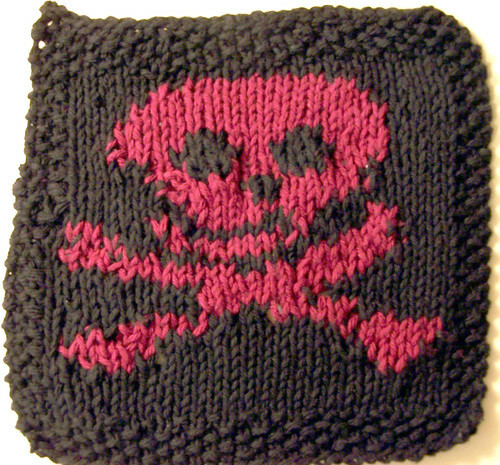 The link to the Skull chart I used to make this pattern can be found here (I used the large one). Please let me know if you find any errors in the pattern as I am remembering it in retrospect and may have gotten something wrong. Row 1 (right side): P1 K1 across. Row 2 (wrong side): K1 P1 across. Row 7 (right side): P1, K1, P1 K to last 3 Stitches, P1, K1, P1. Row 8 (wrong side): P1, K1, P1, P to last 3 stitches, P1, K1, P1. Right side: P1, K1, P1, K3 and start pattern at the bottom (which means you will knit 2 more stitches in color A before beginning work with Color B). Once across first row of the pattern, K3 and work last 3 stitches of row in P1, K1, P1 pattern. Rest of rows for pattern: Continue working back and forth following the pattern beginning with the P1, K1, P1 edge, 3 stitches of stockinette, work across the pattern, 3 stitches of stockinette, P1, K1, P1. Once pattern is complete, work two rows of P1, K1, P1, stockinette across until last 3 stitches, P1, K1, P1. Work rows 1 and 2 as for bottom edge. I might have to try this. I love this.. because my boyfriends mother ((who taught me how to knitt, even though all she knows is how to straight knit scarves)).. believes she's the princess of all the world.. and love pirates. .and has taken on the name pirate princess .. .
but to each their own.. I was wondering since i'm such a novice knitter.. if you could help me with a few things on this pattern. First off i've never changed colors before.. do i just cut and tie off the colors as they come.. ? And would it be possible if i used the grid you have to add a crown on somehow? You're a superstar when it comes to knitting so excuse my lamn and prolly stupid questions.. I would love to use skully as a KAL. Contact me at Cora.Levesque@shaw.ca. I just started and finished this adorable dish cloth and just LOVE it. The pattern and the chart were easy to follow. I made mine in black and white! !